Strawberry season is just around the corner. These juicy red gems are hugely popular for their refreshing and sweet taste but did you know the strawberry is a powerhouse when it comes to nutrition? Oh yes my friend, it’s the best of both worlds – happy taste buds and a happy body! 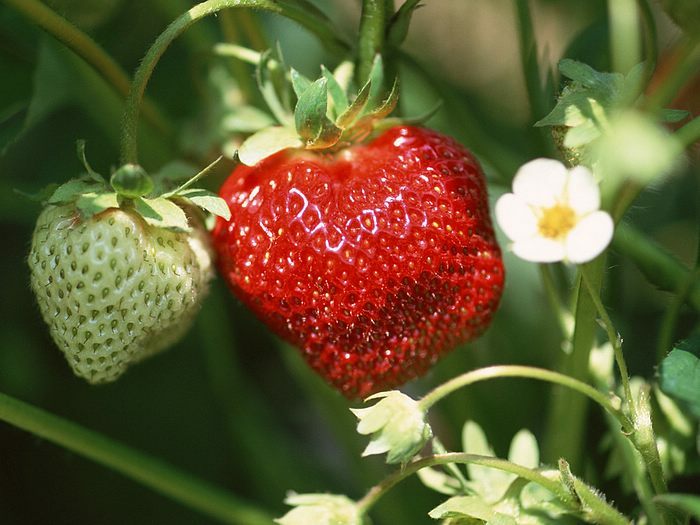 One of the coolest things about strawberries – especially for diabetics – is their blood balancing ability (who knew!). Studies have shown that high blood glucose levels, spiked by excessive sugar consumption (5-6tsp of table sugar), can be actively lowered by simultaneous consumption of strawberries (about 1 cup). How cool is that?! Researchers suspect specific polyphenols in strawberries called ellagitannins are responsible and suggest at least 2-3 servings a week to see glucose lowering effects (serving = 1c strawberries). Sounds good to me! Strawberries are also super high in vitamin C and antioxidants boasting one of the highest antioxidant capacities of any food (according to serving size). They are also packed with fiber, anti-inflammatory phytonutrients (ellagitannins, flavonols, terpenoids, phenolic acids) and digestive enzymes. This makes strawberries an excellent food for preventing cancer, cardiovascular disease, inflammatory conditions (including digestive inflammation, arthritis and macular degeneration). Strawberries even contain small amounts of salicylic acid similar to acetylsalicylic acid found in aspirin. Food really is medicine! Enjoy your strawberries fresh and raw for the greatest health benefit. Choose berries that are firm, plump, free of mould and deep red in colour (but not overripe). Once ripe, store in the fridge and consume as quickly as possible (vitamin C + antioxidant content lowers after 2 days). Buy strawberries organic and in season. They are on the “dirty dozen” list meaning they encounter some of the highest pesticide use. Buy in bulk and freeze your strawberries for a burst of summer in the middle of winter! Wash, cap, and spread in one layer on a baking sheet. Freeze and once frozen transfer to airtight bags or containers for longterm storage. This entry was posted on June 6, 2012 by katelivingfull in Nutritional info and tagged anti inflammatory, antioxidants, blood sugar balancing, strawberries.